Jihad Watch : The driver of the bus was a Muslima in a headscarf, although it should be noted that the bus wasn’t targeted because a Muslima was at the wheel. The last time this happened, the driver was a middle-aged white man. On both occasions, it was the bus that was targeted and not the driver. The focus was on blocking the road and bringing the traffic to a halt. Anti-Trump supporters had shut down central London the day before, and earlier on Saturday afternoon the police refused to allow pro-Trump supporters to gather outside of the US Embassy to show their support for the President. Also, it should be noted that on both occasions, both bus drivers could do nothing more than stay in their seats and wait for the police to disperse the crowd in order that their buses could continue on their way. 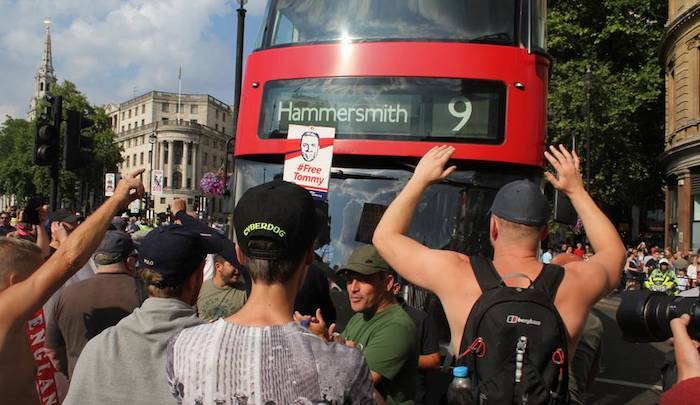 The last time this happened, when the white middle-aged bus driver was at the wheel, the newspapers focused on the disruption by the “far-right” drunken mob. This time, the reporters ran with the headline that a Muslima in a headscarf demonstrated to the world everything that is great about Britain. She, like the other white bus driver, sat calmly, sometimes smiling, and always waiting for police direction. She, unlike the white bus driver, is now being touted as the face of everything that makes Britain great – tolerance, patience, a sense of humour, the ability to laugh in the face of a perceived threat by “nazis,” courage and the refusal to leave her station (even although she and her passengers were never in any danger, and there was never any reason as to why she or the other bus driver should have abandoned their vehicles).